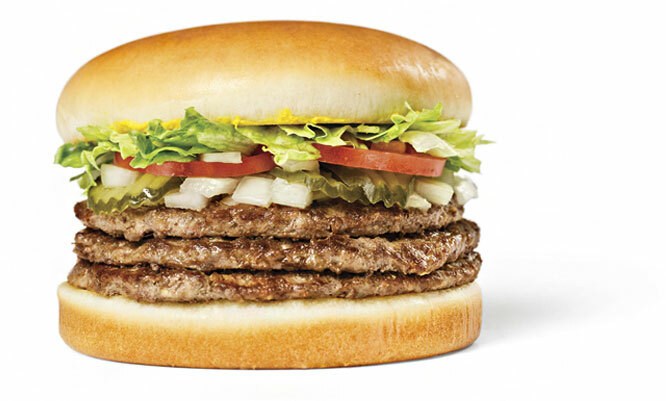 Once, twice, three times a burger. Ingredients: Beef Patty, Large: USDA inspected 100% ground beef. Large White Bun: Unbleached enriched flour (wheat flour, malted barley flour, niacin, reduced iron, thiamin mononitrate, riboflavin, folic acid), water, high fructose corn syrup, soybean oil, contains 2% or less of each of the following: yeast, wheat gluten, salt, dough conditioners (contains one or more of the following: sodium stearoyl lactylate, calcium stearoyl lactylate, monoglycerides, mono- and diglycerides, distilled monoglycerides, calcium peroxide, calcium iodate, datem, ethoxylated mono- and diglycerides, enzymes, ascorbic acid), calcium sulfate, calcium carbonate, ammonium sulfate, sorbic acid, soy flour, monocalcium phosphate, soy lecithin, and calcium propionate (to retard spoilage). May also contain grain vinegar, cornstarch, citric acid, and potassium iodate, and calcium phosphate. Contains: Wheat, Soy.. Mustard: Water, vinegar, mustard seed, salt, turmeric, garlic, oleoresin paprika (color). Iceberg Lettuce: U.S. No. 1 crisphead (Iceberg) lettuce. Tomato: U.S. No. 1 tomatoes coated with vegetable-, petroleum-, beeswax-, and/or shellack-based wax or resin. Pickles: Sliced cucumbers, water, vinegar, salt, alum, calcium chloride, natural flavoring, sodium benzoate and potassium sorbate (preservatives), oleoresin turmeric & yellow #5 (colors), polysorbate 80 (emulsifier). Diced Onions: Diced, U.S. jumbo yellow onions. Special Seasoning: Salt (yellow prussiate of soda added) and pepper. Ingredients: Large White Bun: Unbleached enriched flour (wheat flour, malted barley flour, niacin, reduced iron, thiamin mononitrate, riboflavin, folic acid), water, high fructose corn syrup, soybean oil, contains 2% or less of each of the following: yeast, wheat gluten, salt, dough conditioners (contains one or more of the following: sodium stearoyl lactylate, calcium stearoyl lactylate, monoglycerides, mono- and diglycerides, distilled monoglycerides, calcium peroxide, calcium iodate, datem, ethoxylated mono- and diglycerides, enzymes, ascorbic acid), calcium sulfate, calcium carbonate, ammonium sulfate, sorbic acid, soy flour, monocalcium phosphate, soy lecithin, and calcium propionate (to retard spoilage). May also contain grain vinegar, cornstarch, citric acid, and potassium iodate, and calcium phosphate. 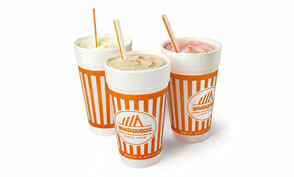 Contains: Wheat, Soy. Beef Patty: USDA inspected 100% ground beef. Bun Oil: Liquid and hydrogenated soybean oil, soy lecithin, natural & artificial flavor, beta-carotene (color), TBHQ and citric acid added to protect flavor, dimethylpolysiloxane, an anti-foaming agent added. Mustard: Water, vinegar, mustard seed, salt, turmeric, garlic, oleoresin paprika (color). Iceberg Lettuce: U.S. No. 1 crisphead (Iceberg) lettuce. Tomato: U.S. No. 1 tomatoes coated with vegetable-, petroleum-, beeswax-, and/or shellack-based wax or resin. Pickles: Sliced cucumbers, water, vinegar, salt, alum, calcium chloride, natural flavoring, sodium benzoate and potassium sorbate (preservatives), oleoresin turmeric & yellow #5 (colors), polysorbate 80 (emulsifier). Diced Onions: Diced, U.S. jumbo yellow onions. Special Seasoning: Salt (yellow prussiate of soda added) and pepper. French Fries: Potatoes, soybean oil, dextrose, disodium dihydrogen pyrophosphate (to maintain natural color). 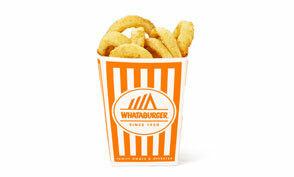 (Note: Deep-fried in ZTF Whataburger liquid shortening and seasoned with Whataburger fry salt. Menu items that are deep-fried may come in contact with other products that contain gluten, wheat, dairy, egg, soybean, fish, or animal products.) Fry Salt: Salt flour consisting of natural crystalline. Coca-Cola® Classic: High fructose corn syrup, water, caramel color, phosphoric acid, natural flavors, and caffeine. Ingredients: Beef Patty, Large: USDA inspected 100% ground beef. Large White Bun: Unbleached enriched flour (wheat flour, malted barley flour, niacin, reduced iron, thiamin mononitrate, riboflavin, folic acid), water, high fructose corn syrup, soybean oil, contains 2% or less of each of the following: yeast, wheat gluten, salt, dough conditioners (contains one or more of the following: sodium stearoyl lactylate, calcium stearoyl lactylate, monoglycerides, mono- and diglycerides, distilled monoglycerides, calcium peroxide, calcium iodate, datem, ethoxylated mono- and diglycerides, enzymes, ascorbic acid), calcium sulfate, calcium carbonate, ammonium sulfate, sorbic acid, soy flour, monocalcium phosphate, soy lecithin, and calcium propionate (to retard spoilage). May also contain grain vinegar, cornstarch, citric acid, and potassium iodate, and calcium phosphate. Contains: Wheat, Soy.. Mustard: Water, vinegar, mustard seed, salt, turmeric, garlic, oleoresin paprika (color). Iceberg Lettuce: U.S. No. 1 crisphead (Iceberg) lettuce. Tomato: U.S. No. 1 tomatoes coated with vegetable-, petroleum-, beeswax-, and/or shellack-based wax or resin. Pickles: Sliced cucumbers, water, vinegar, salt, alum, calcium chloride, natural flavoring, sodium benzoate and potassium sorbate (preservatives), oleoresin turmeric & yellow #5 (colors), polysorbate 80 (emulsifier). Diced Onions: Diced, U.S. jumbo yellow onions. Special Seasoning: Salt (yellow prussiate of soda added) and pepper. 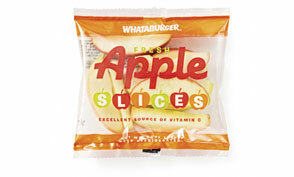 Apple Slices: Apples, ascorbic acid, (Vitamin C) to promote whiteness and calcium carbonate to maintain texture. Unsweetened Iced Tea: Water, orange pekoe and pekoe cut black tea.